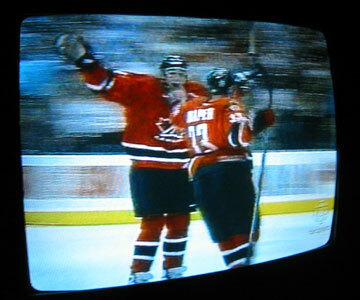 Congratulations to Canada on winning the ice hockey World Cup beating Finland 3-2. Although the match was played downtown, tickets for such a big game are harder to come by than rocking horse droppings, so we retired to a pub in Unionville to watch it on TV. Thanks to DaveO and Arthur i had half a clue what was going on and now know what “One Timer” and “Power Play” means. A couple of hours later and i can still hear a few mad Canucks out and about waving flags out of car windows and banging their horns. It’s more Torino than Toronto really. A Whatfettle article by Paul Downey published Wednesday, September 15th, 2004, at 5:06 am under a Creative Commons License.